Kheddah Shikar is a method of capturing wild elephants, where stockades will be allowed to be built in strategic locations and where herds of wild elephants can be driven into and trapped in such stockades. The system was further developed by G.P. Sanderson, who made his successful attempts in 1874. Sanderson was in charge of the Kheddah department of the British government of India at Dhaka and Mysore, and he captured hundreds of elephants in south and northeast India. Hermann Wiele, who delivered many animals to Firma Carl Hagenbeck, writes in his book about a Keddha in Karapura, Mysore, Karnataka, honored to the Vice Prince of India, where 82 elephants were caught. Some of those elephants were imported to Firma Hagenbeck, through John Hagenbeck. 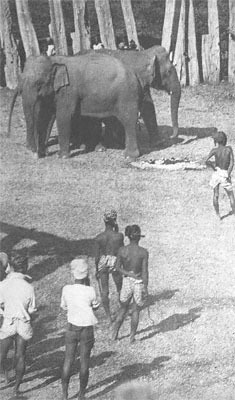 Hunting and capturing Wild Elephants in India became prohibited 1977.